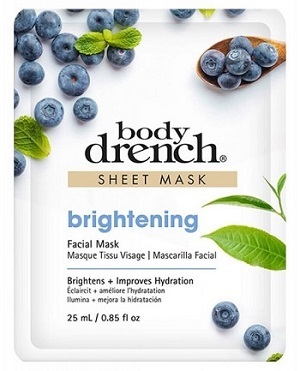 Body Drench Brightening Facial Sheet Mask, Single Use Packet, .85 fl. oz. Helps even out skin tone, restore the look of radiance, and brighten the appearance of dark spots all while achieving that perfect glow. Infused with several key ingredients including white tea, blueberry, and lilium candidum flower. Blueberry helps defend against dull skin, restores radiance and significantly improves complexion. Brightens the appearance of dark spots. White Tea helps even out skin tone and reduces the appearance of fine lines.